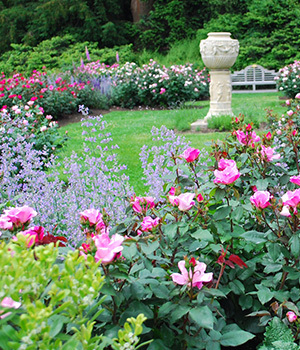 The land the Morrises purchased in Chestnut Hill was barren, with poor soil that drained too quickly; but with diligent care they surrounded their home with a landscape and plant collection devoted to beauty and knowledge. Two Lines a sculpture by George Rickey marks the former mansion site. The Widener Visitor Center was formerly the carriage house. John was a noted plantsman and community leader who explored the new world of knowledge available to Victorians. John and Lydia traveled widely in America, Asia, and Europe bringing ideas, artwork, crafts and plants back to Compton. They shared a love of history and art, and established a tradition of placing sculpture in the garden that continues today. The Morrises were active in civic affairs and preservation, and believed in the power of education. It was their earnest hope to be judged "worthy stewards."